Beam Up: This palm-size digital clock flips open (like Captain Kirk's communicator) to reveal big LCD numbers. 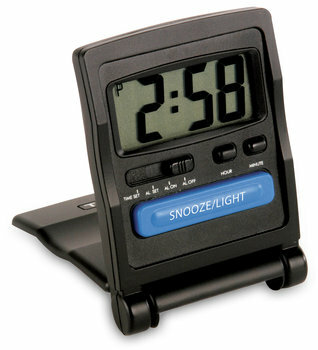 Little Clock, Big Features: Touch a button and the time shines with a bright night-light. It includes a repeating snooze alarm with a large snooze bar. Easy to Use: Uncomplicated yet reliable, it features well-labeled controls, a large display, and simple yet complete instructions. Fold it flat and store in it in its own protective cover when travelling. The Basics: Comes in black; AAA battery not included. Dimensions: 3 ½ " x 2 ½" x ¾"